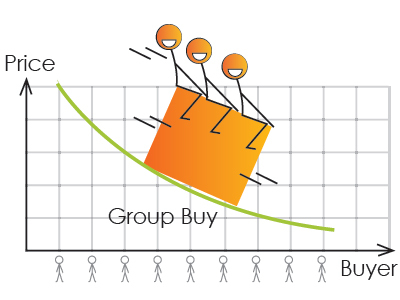 Group Buying is not a new concept even though it has become very popular in internet shopping since the Global Recession of 2008. Groupon & Living Social etc. have popularised this age-old volume leverage technique, but traditional buying groups have existed for decades, helping cooperatives and buying clubs pool their buying requirements to leverage better deals. Purchasing consortia have established themselves as a vital link in today’s world-class supply chain strategies, used as a powerful tool to significantly reduce costs in the most effectively run procurement organisations (not just for SME’s which is a common misconception). Cooperative commerce facilitating Group Purchasing Organisations (GPOs), has in-fact been around for a hundred years, with the first healthcare GPO established in America in 1910. While the modus operandi has not changed since, with buyers empowered to aggregate their purchasing power and obtain lower prices than they otherwise would be able to get individually. So the business case for buyers is obvious, with the opportunity to reduce commodity costs directly by 10-20% plus the reduction in time spent sourcing, negotiating and administering individual product/service deals. Suppliers also benefit with the opportunity to reduce their Cost of Sale (& possibly Logistics Costs), while they increase turnover and market share. Manufacturers can often offload excess inventories, while certain suppliers use collective purchasing groups to launch new products on the market (again availing of low customer acquisition costs). However, the diminishing success of Groupon has highlighted one of the age-old flaws with Group Buying – greed! The value for buyers and suppliers needs to be sustainable, while there should be limited hassle or “friction” for buyers and suppliers to engage in group buying activities. Greed – is the business model viable for the buyer, supplier and GPO? So what other Group Buying Challenges have you met?